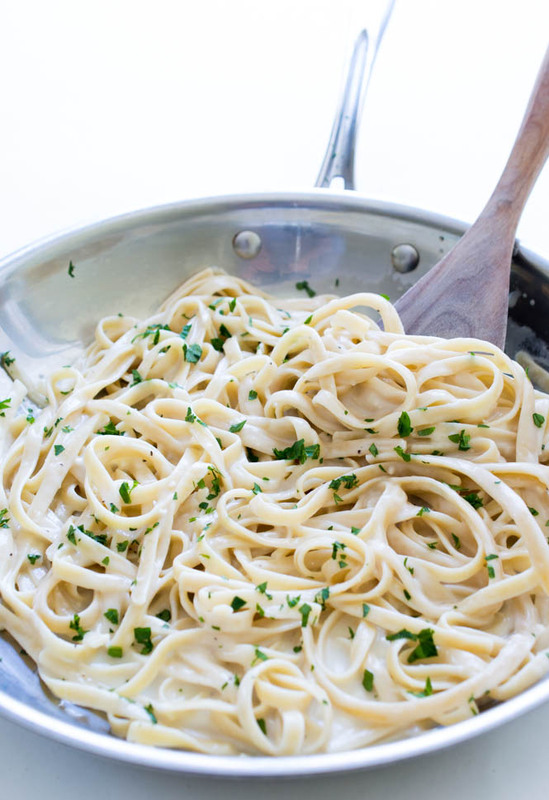 Rich and Creamy Skinny Fettuccine Alfredo. Under 500 calories a serving! Tastes just like the original! Fettuccine Alfredo is one of my favorite comfort foods. How can you not love a thick creamy cheese sauce tossed with tender thick fettuccine noodles? I came up with a way to eat my favorite comfort food and not feel guilty about it. 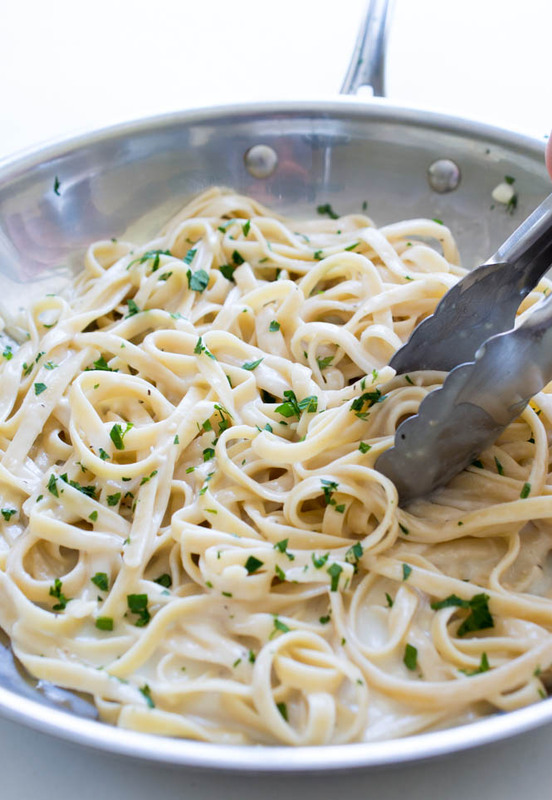 This Skinny Fettuccine Alfredo tastes just as good as the original and is so much healthier. This pasta comes together in under 20 minutes making it a quick and easy weeknight meal. 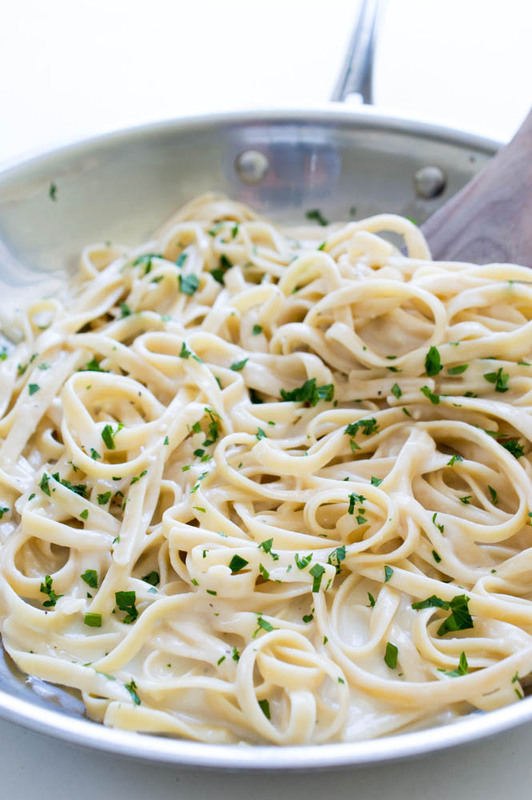 This Skinny Fettuccine Alfredo comes in just under 500 calories a serving. This pasta can easily serve 4 alongside a side salad. For hungry pasta lovers like myself and my boyfriend it serves 2 just fine. I swapped out tons of calories using 1% milk instead of heavy cream and low sodium chicken broth for flavor. Olive oil was used in place of butter and tons of garlic is added. For extra flavor and a hint of color garnish with fresh parley and an extra squeeze of lemon juice. You would never know this Fettuccine Alfredo is low-calorie. 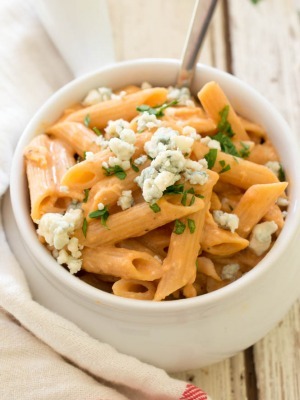 It is bursting with flavor and is rich and creamy just like the original. The Alfredo sauce starts with a simple roux of olive oil and flour which helps thicken our sauce. I like to make the Alfredo sauce while the pasta is cooking and toss everything together at the end. 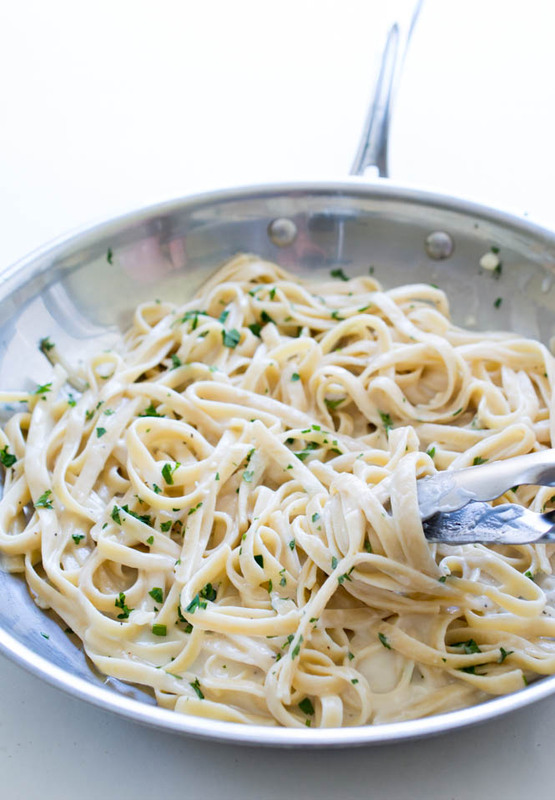 Skip the restaurant style Fettuccine Alfredo and give this Skinny version a try! Boil pasta in salted water until al-dente per package instructions. Meanwhile, add olive oil and garlic to a large saute pan. Cook for 1 minute. Whisk in flour and cook an additional minute stirring constantly. Slowly pour in the chicken broth and milk and bring to a simmer. Cook until thickened 3-5 minutes, stir frequently. Take off the heat and stir in Parmesan cheese. Toss the sauce with cooked pasta and drizzle with lemon juice. Season with salt and pepper and serve immediately with parsley for garnish if desired. 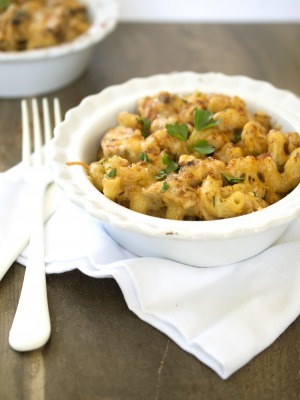 I added a little more garlic and Parmesan cheese for more flavor and it turned out yummy! made this tonight with my boyfriend and threw it away afterwards. in the future, it DEFINITELY needs more seasoning. very bland. if you make this, add more garlic and other seasonings to spice it up a bit. 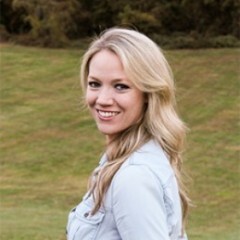 I am so sorry to hear this! You can always season to taste with salt and pepper and add extra parmesan cheese to add flavor. I made it today for my kids and it was great!! I did more garlic (can never have too much garlic in our house) and more Parmesan cheese and it was awesome. Didn’t have lemon juice so I added lemon pepper and it’s amazing!! Great recipe. I am so happy to hear you and your family enjoyed this recipe!! 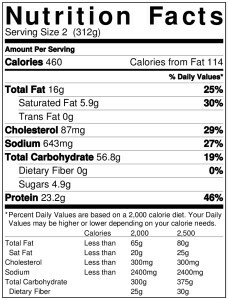 the nutrition facts it says that it’s 306 calories per serving but in the nutrition label at the bottom it says it’s 420. I was just wondering which one it really is? Sorry for the confusion. The 306 calories was what I calculated personally, the 420 is a nutrition generator that is used on my site. 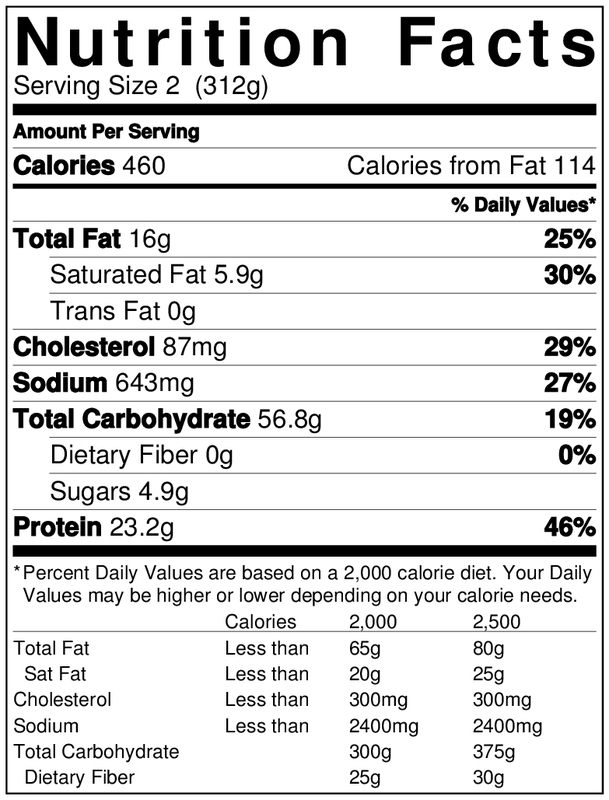 All nutrition facts will vary a bit depending on the products you use. I would just use 350 as a good medium if you are counting calories. So glad you love this! Thank you!! This was excellent! A garlic lover, I as well upped the garlic amount. Love this recipe. I used Banza chickpea pasta in place of fettucini for an even healthier version as im doing low carb . Its not a heavy sauce which was appreciated. I’m so glad you liked the recipe. Yeah, you can never have too much garlic!